Oh, Revolution. You continue to make my heart swoon. I followed your brewpub’s construction progress on Facebook for what seemed like forever (I think it was actually a year) and made sure the hubby (then my fiancé) and I were in attendance opening night. Since that magical February evening when you finally opened your doors, I have been there, on average, once a week. Both the hubby and I are proud mug club members and frequently stop by the brew pub on a Wednesday evening for the free samples of the newly released beer. And the beer! From Eugene’s chocolaty, malty goodness to the hop assault of Anti-Hero, to the insanely flavorful barrel aged beers and one-offs, they leave me wanting more. If you can’t already tell, I am a huge fan. So when I heard they were building a production brewery and I would soon be able to enjoy the brews at home sans growler, I could barely contain my excitement. At my hubby’s urging, I emailed Michelle Foik, Revolution’s Czar of Operations, and inquired about possibly getting a tour of the new space. To my surprise, I got an enthusiastic email from Michelle saying she would be happy to give us a tour. We set the date of February 20, 2012 (I had President’s Day off from the day job) and I anxiously awaited the time when I could see the new addition to the Revolution family. The hubby and I met Michelle outside the Revolution Brewing production brewery located at 3340 N Kedzie and she led us up a short flight of stairs and into a large open space. As you enter, the first thing you notice is the sheer size. This place is huge; it literally took my breath away. Then you catch sight of the tap room, which is situated close to the entrance and will remain a mostly unfinished space with a chain link fence partitioning off the customer area from the workspace. The back wall of the tap room is a large pane-glass window over-looking the brewery where guests will be able to see and hear all the goings-on and see the brewers in action. Looking through the glass wall of the tap room, Josh Deth works on the canning line. On this particular day, Josh Deth, Chairman of the Party himself, was putting together the canning line that is located just on the other side of the tap room, and even stole Michelle away from her tour guide duties to help him out on one occasion. 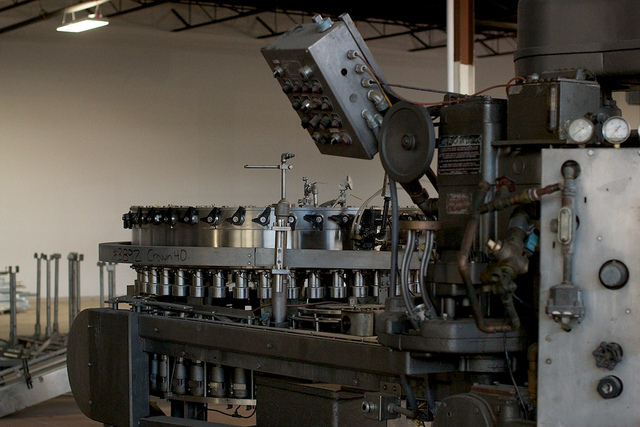 This canning line was a sight to see; it used to be in an old Stroh’s plant before it was used to can soda. Soon it will be the heart of the bustling workshop, churning out cans of Anti-Hero and Bottom-Up Wit for die-hard Rev fans to enjoy. As you are facing the tap room, to the right-hand side will be the barrel aging room. While the barrel aging program will start right away, the physical room may take a little longer as it is not in the initial budget. Right now, there is just a bunch of dust and a soda mixer (it came with the canning line) but soon there will be rows and rows of barrels. Such a beautiful thought… We walked past the barrel section to the far back wall where the brew house and the fermentors were recently installed. The brew house is pretty spectacular. Michelle led us up the stairs (she had to check with Deth first to make sure it was actually put together and we could climb the stairs without plummeting to our deaths) and showed us around the hot liquor tank, mash tun, and boil pot. While fully computerized brew houses are now available, Michelle asked Jim Cibak, head brewer of Revolution Brewing, if he still wanted to be a part of the process or if he wanted a computer to do it all. 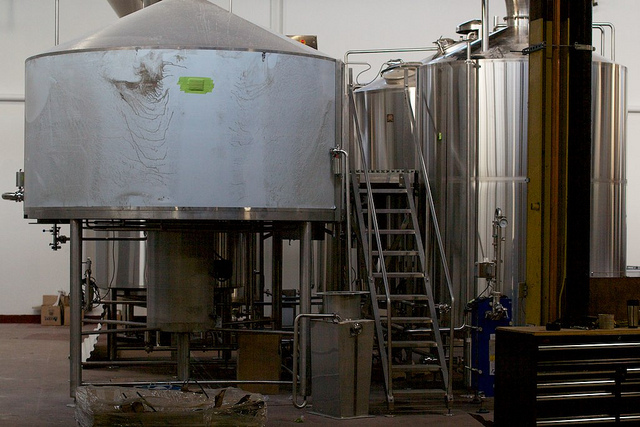 Thankfully, Cibak chose for a hybrid brew house that does include a computer interface but still requires the brewer to play an integral role. Now you may be wondering if the new set up is bigger than the one currently situated behind a stained glass partition in the brewpub. Well, the answer is yes. Almost three times bigger! While the brewpub can put out 15 barrels of beer per brew session, the new brew house produces 45 barrels. 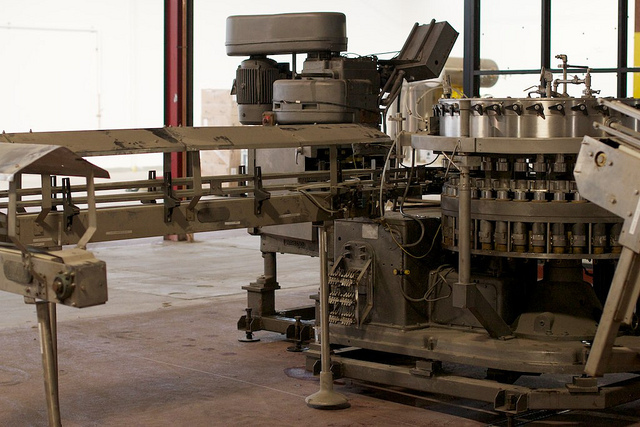 And the fermentors are much bigger, too. While there are three smaller fermentors that will be used for small batch beers, the rows of gigantic fermentors are truly amazing. Those big ones will be used for everyday beers that will go into cans while the smaller ones will be for the ones going into barrels and/or 22-ounce bomber bottles. Beyond the brew house, they are constructing a series of offices for the brewers. Michelle explained that the majority of the quality control measures will take place here, including taking samples from each brew so if there are ever any complaints, they will know specifically which batch is in question. Past the offices is a concrete milling room; concrete so that if the grain combusts, it will be locally contained. 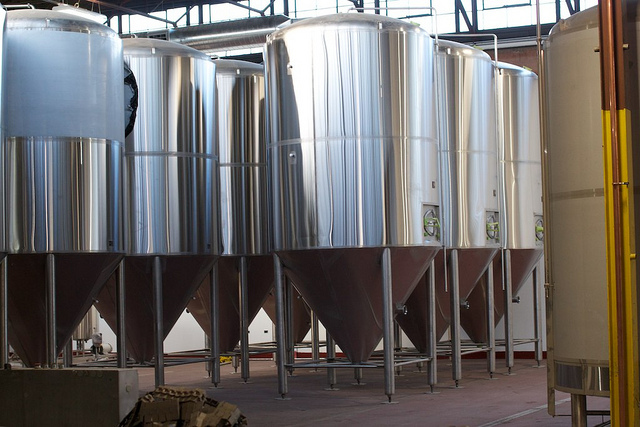 So much you have to think about when opening a brewery! Michelle led us outside to where the silo will be installed. She indicated that she is a little concerned that the grain will be stored so far away from the brew house and she isn’t quite sure how the grain will be brought in, although it will probably be sent to the brew house by a conveyor belt. If you are interested in the beer that will be going to market, Anti-Hero and Bottom-Up Wit will definitely be the first ones off the canning line. Then there are plans to introduce Eugene Porter and Rosa, their ale brewed with hibiscus. For one-offs, they are planning on bottling Mad Cow Milk Stout, Double Fist Double Pale Ale, and Coup d’Etat, their deliciously spicy farmhouse ale. At first they are looking for distribution throughout Chicago and then the surrounding suburbs. After that, they are looking to move out of state, maybe to Iowa, Ohio, and New York. Why those three states? Well, they have been the ones expressing the most interest. And they are hurting more for good beer than, say, the surrounding states of Wisconsin and Michigan. 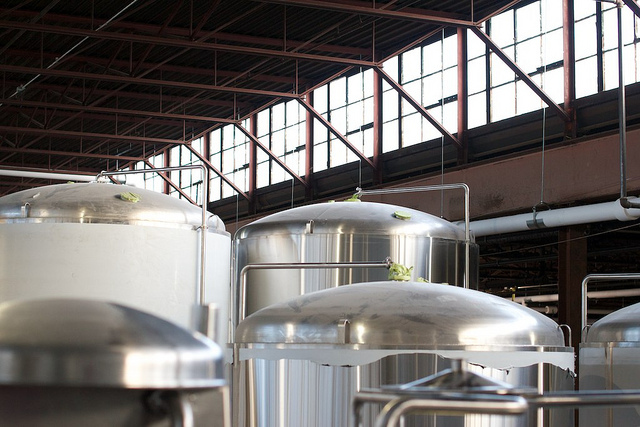 I asked if a production brewery was always part of the business plan and Michelle said yes, but she didn’t expect it would happen so soon; she thought it was part of the five year plan rather than the two year plan. It’s true; Revolution has exploded since its opening two years ago. And I foresee it will only get bigger. And that’s another decision the owners and management must make: how big do they want to get? My impression from Michelle is that they still want to remain relatively small and be able to fully support the Chicago community. Regardless, though, additional fermentors were added so they can make a seamless transition and meet demand when that time comes. 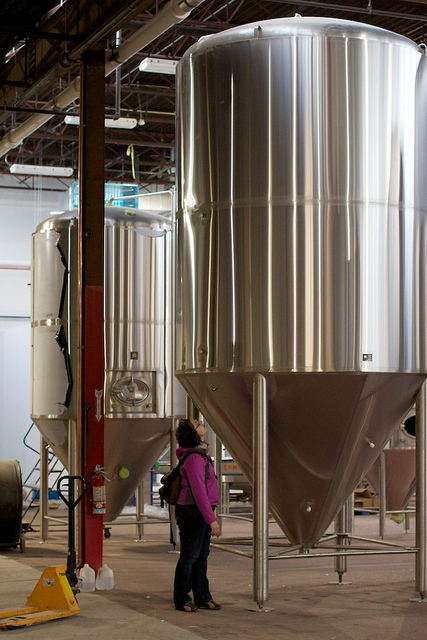 “There’s lots of room for growth,” said Deth, staring upward at the tall fermentors. According to Deth, they will begin brewing soon and cans should be making their way to market in April, with the tap room opening to the public in June or July. When the facility is open, they plan on being open Wednesday and Thursday 1 pm – 10pm, and Friday and Saturday 1 pm – midnight. Tours will be every night at 6 pm, with a possible afternoon tour on Saturdays. There are even some events on the horizon, including one during the upcoming Chicago Craft Beer Week. They have a pretty large parking lot in the back where they hope to stage festivals and parties. If you can’t already tell, I am super excited for this. A huge thank you to Michelle Foik for playing tour guide for the day and to Josh Deth for imparting a few words of wisdom. 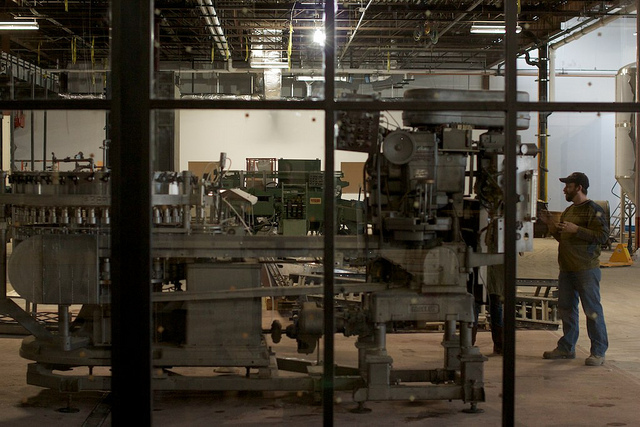 If you want to follow the progress of the new production brewery, be sure to check out their webpage, and be sure to “like” them on Facebook and follow them on Twitter! I can’t wait for the beer to be flowing! Jessica, as always, your blog intrigues me and broadens my perspective of the world of beer. Not just beer — finely crafted, artsan beer. You have really broadened my beer horizons (this girl never used to like beer!) I look at beer now like fine food or wine, what goes in and how it is made makes all the difference. Thank you for opening my eyes to the true artistry that is craft brewing. I love your blogs, they are entertaining and informative. They have educated me on the culture of craft brewing and its wonderfully creative masters. Have you ever thought of doing a spot on the Food Network?? I would tune in to see what new breweries you would feature. You could be like Adam on Man vs Food (Girl vs Beer??!). Except you wouldn’t pig out on beer, that would not be pretty, but you would feature the beat craft beers and micro breweries in towns across the country??! I think that would be awesome!